Satoshi Itasaka’s adorable EVA chair comes in candy colors that every kid will love: pink, baby blue, juicy orange and grassy green. Flat packed for easy storage and shipping, this cheery perch is recyclable, eco-friendly, and easy to assemble. After set-up, the EVA chair forms a Mod-inspired circular chair perfect for stylish little play rooms. 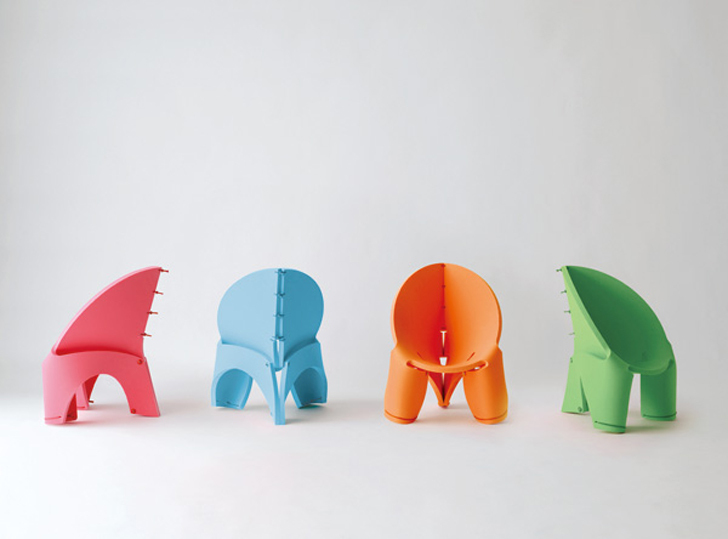 The chair’s design is reminiscent of animal shapes, with stubby legs that will inspire imaginations and hours of play. Once kids have outgrown the little seats, the entire chair can be recycled, fostering a sustainable lifestyle that begins during childhood! 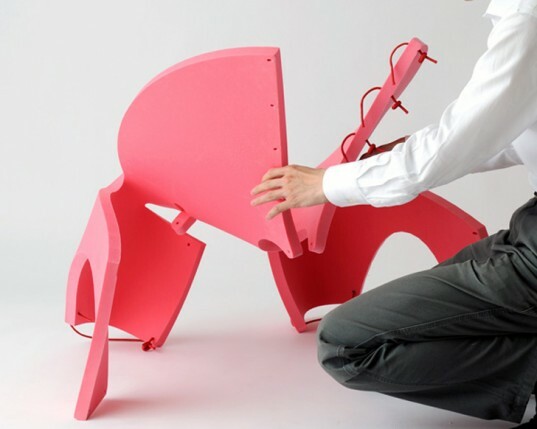 Each chair is made from non-toxic and flexible plastic, which can withstand horsing around and the usual wear and tear of life in a playroom. The plastic is soft and durable, bouncing back after being stepped-, jumped- or played on. The flat packed chairs are delivered as a smooth single sheet, which equates to low-energy transport. Kids and adults can work together to fold the pieces into place, snapping the back and base with easy-on-little fingers string. The entire chair back and base are held together with color coordinated pieces of durable string, and secured in place with toggles. No bolts, nails or sharp fasteners are used in the assembly of the EVA chair, so your kids can help fashion their new favorite place to sit. Still a concept at this juncture, we’re hoping these clever chairs make it to production. Satoshi Itasaka�s adorable EVA chair comes in candy colors that every kid will love: pink, baby blue, juicy orange and grassy green. Flat packed for easy storage and shipping, this cheery perch is recyclable, eco-friendly, and easy to assemble. After set-up, the EVA chair forms a Mod-inspired circular chair perfect for stylish little play rooms. The chair�s design is reminiscent of animal shapes, with stubby legs that will inspire imaginations and hours of play. Once kids have outgrown the little seats, the entire chair can be recycled, fostering a sustainable lifestyle that begins during childhood!